Becoming more like our Lord and Savior Jesus Christ—spiritually more attentive, personally more sensitive, more tender, more gracious—ought to be the desire of every Latter-day Saint. But how can we accomplish that? In this thoughtful volume and with his warm, accessible style, author Robert L. Millet shares poignant stories and fresh scriptural and doctrinal insights to help us feel our Savior's love and realize that He stands ready to assist us in coming to know Him. Brother Millet's heartwarming reflections on what it means to worship Christ and to trust in Him and in His grace renew in us a desire to stay focused on our Savior through all the ups and downs of daily life. Insights into how much Christ loves us and how He can lift us up to where He is strengthen our commitments to Him. Throughout, Brother Millet conveys his deep witness of the essential truth that eternal life consists of knowing God and His Only Begotten Son, Jesus Christ. Coming to Know Christ invites us to experience what it means to know our Lord—not just know about Him but how to come to know Him, our Savior and our Redeemer. Throughout this book there are insightful tidbits of information that have strengthened my knowledge and testimony of Christ and his gospel. I have followed Bro. Millet's literary works for several years now and found he has the knowledge and experience to share what is true so that others may glean from his insight what matters most about the gospel. This wonderfully written volume is worth reading over and over again like the scriptures as it will command attention to the details you may miss from any previous reading. As the title indicates this is really what the gospel is all about coming to know, understand and follow the Savior so that we may become like him. I am grateful for the wisdom of Bro. MIllet in his writing of the volume and so many others that will help those who take time to devour the contents in such a way as to change their lives and heart about the gospel. This is a great book! I loved it. It is not a quick read...it is a read and ponder book. I'm ready to read it again, I'm sure I will get much more out of it again. This is the first book I have read of his, but I have heard some of his lectures on the Mormon Channel, I am a fan. 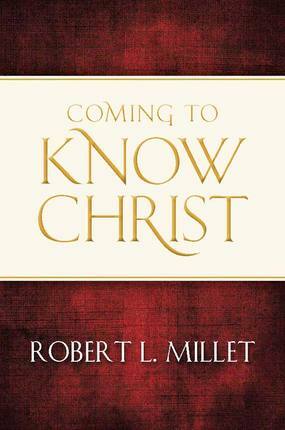 In his book, Coming to Know Christ, Robert L. Millet addresses the concerns of how to be closer to the Savior by feeling of his love for us and by, literally, getting to know Him better. Millet is a professor of ancient scripture at BYU and his book is full of stories, quotes and gospel principles that point us toward a stronger relationship with Christ. This book is full of his testimony and I could feel Millet's love for the Savior, his love of the gospel & scripture and the love that he put into this book. I deeply appreciate his insight and because of the depth of the subject this book is not an easy read. I struggled through this book, often re-reading paragraphs several times to really grasp what Millet was trying to convey to me. The material is heavy and relevant and someone more academic and scholarly than I will enjoy this book and glean more from its pages. With that being said, I was still moved by his stories, the quotes were inspiring and I could truly feel his testimony flowing through each chapter.